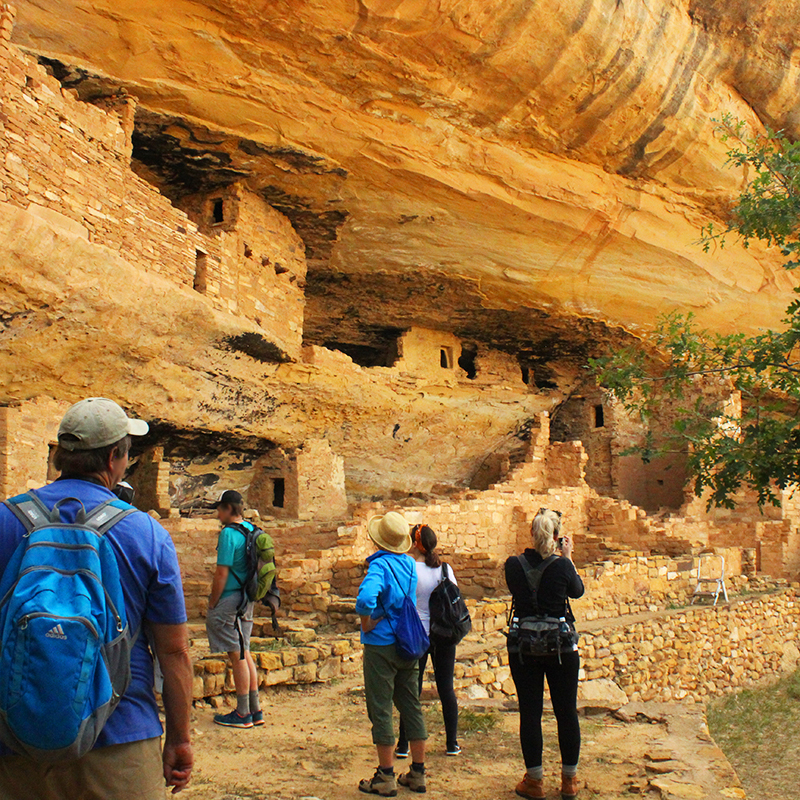 We’re always on the quest for tours to explore and educate us about the amazing Mesa Verde National Park area of SW Colorado. 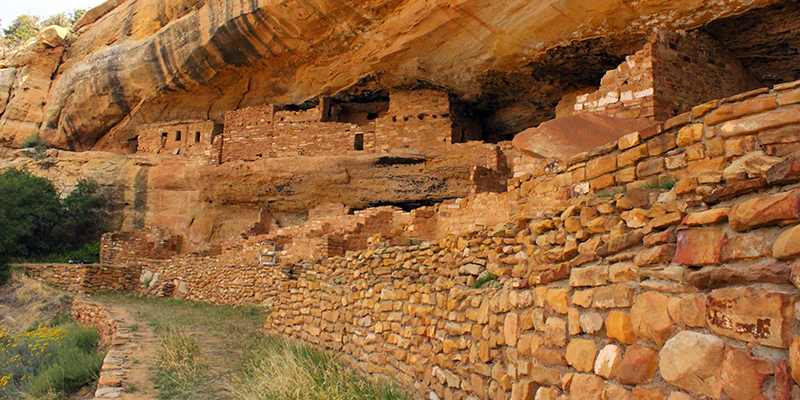 Today we are traveling back in time to over 800 years ago with a visit to Mug House Cliff Dwelling. 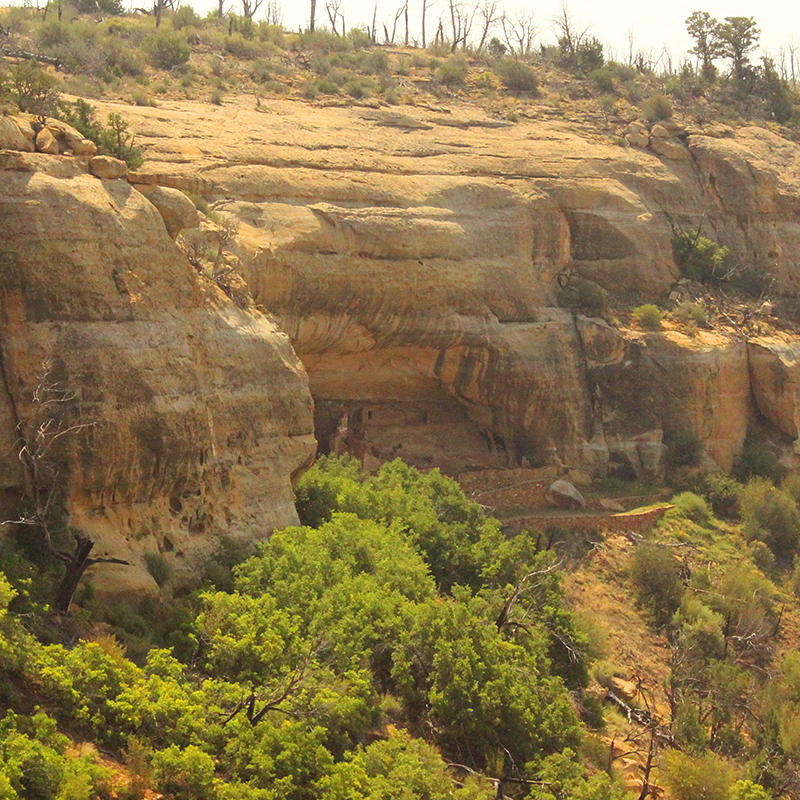 For many people in the area, this is their favorite dwelling and hike. And now we get it! This is a small, exclusive tour for ten people requiring reservations. Not a major attraction like Cliff Palace (the Waldorf Astoria of the park) or Balcony House (the fortress with tunnel and hair-raising sheer cliff climb) … Mug House is an intimate tour where you have more time with the ranger to ask questions and explore. 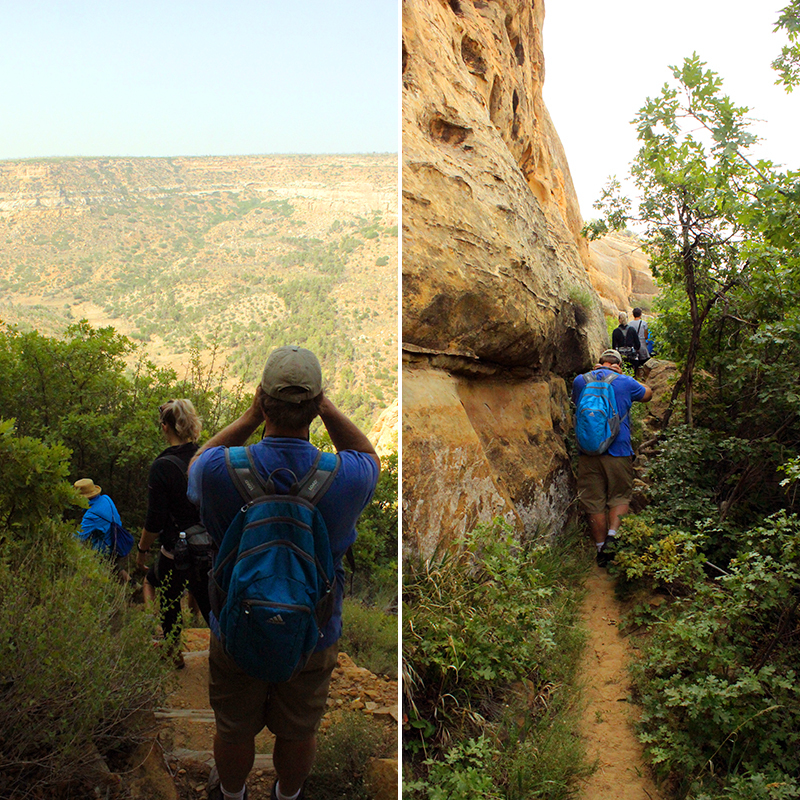 Located on the West, Weatherill Mesa side of the park, our group met on a quiet summer morning with a light breeze where we got instructions from the ranger about safety, and to make sure we were all up to the slightly strenuous challenge. 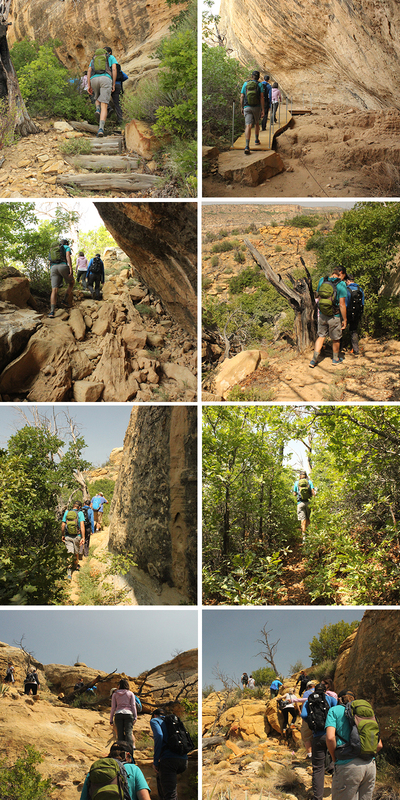 You will shimmy around and scramble over rocks, so best to wear boots or sturdy shoes. 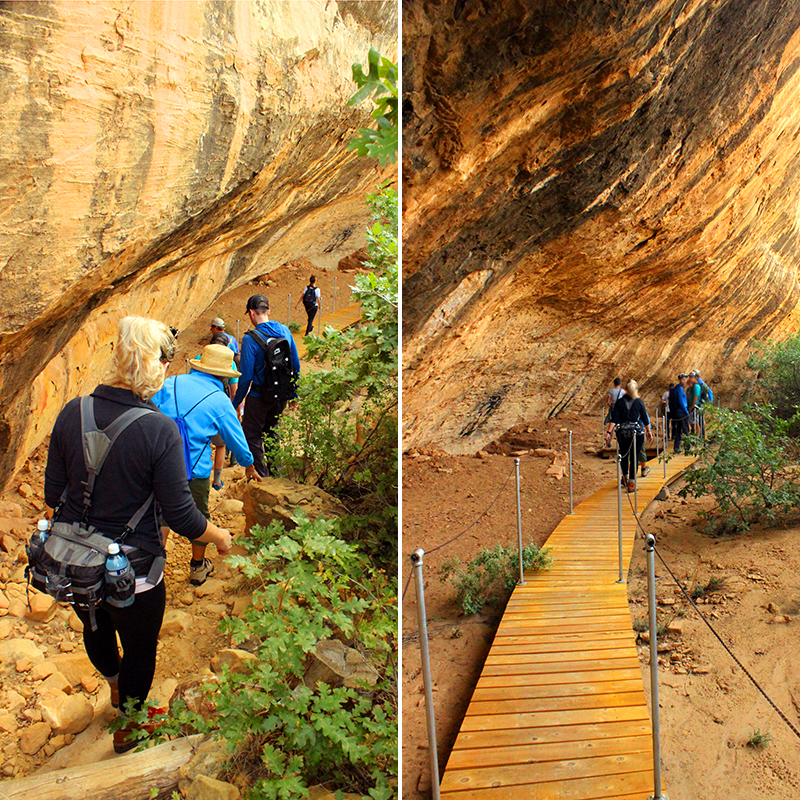 And as always, bring plenty of water for this 2-hour, 3-mile round-trip hike along an unpaved, uneven trail that descends into the canyon with narrow passages and loose gravel switchbacks. 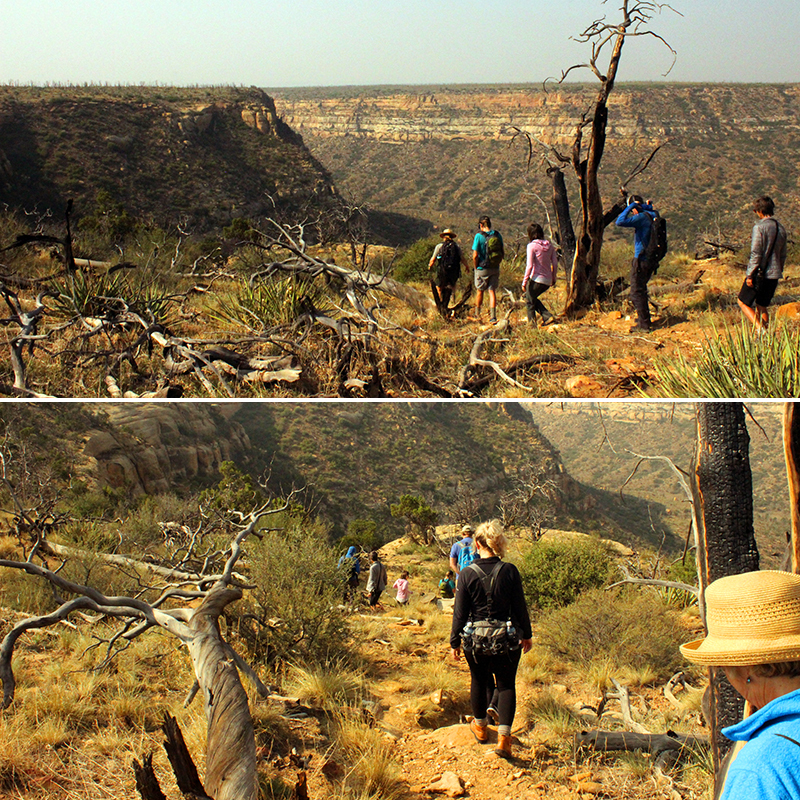 The nice part is that this hike is in the shade for most of the morning tour. 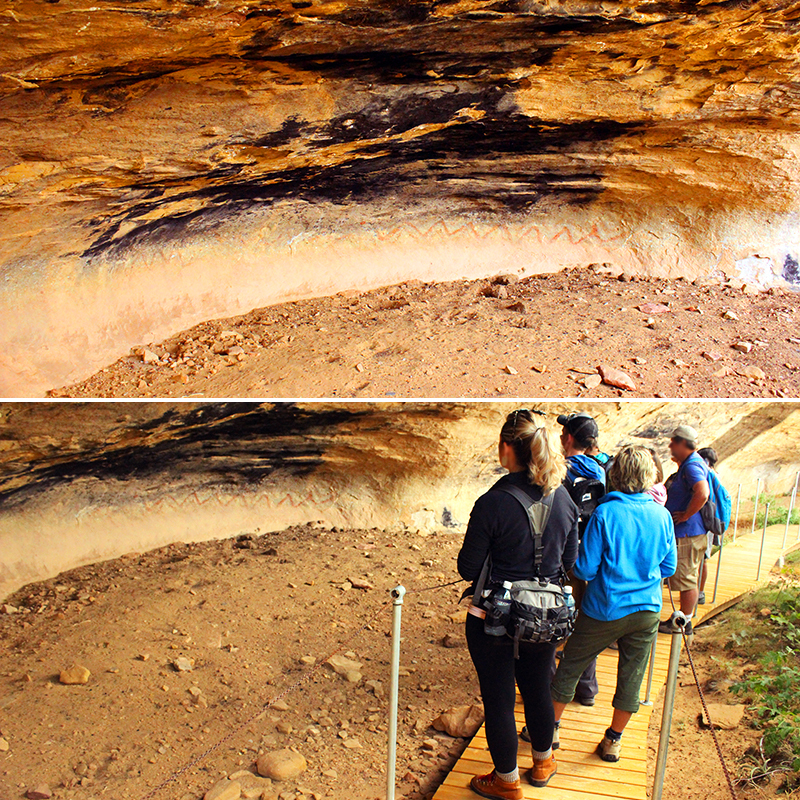 First stop — an alcove called Painted Cave seen below, that gets it’s name from the 2 jagged red pictograph lines painted on the wall (as opposed to petroglyph rock art that is carved into the stone). Could it be a symbol for a snake? Shortly down the path in another alcove is Adobe Cave that gets its name from the clay and mud that was excavated by the Ancient Puebloan people to construct Mug House. 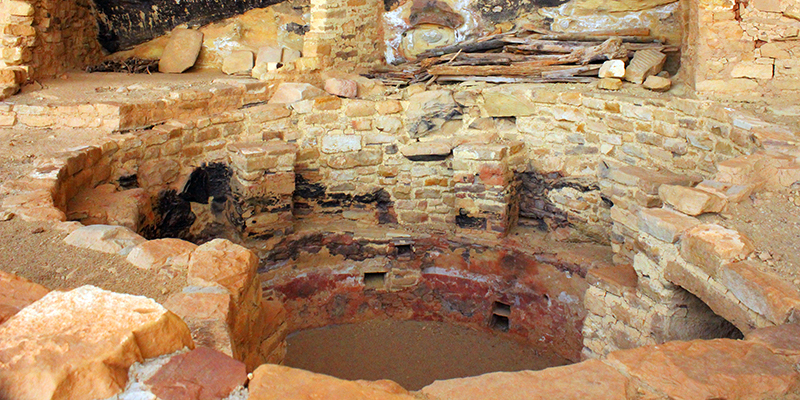 The pit seen below is where they found this rich source of clay, dug for it and mixed it into adobe, and transported it to the nearby alcove they had chosen for building. 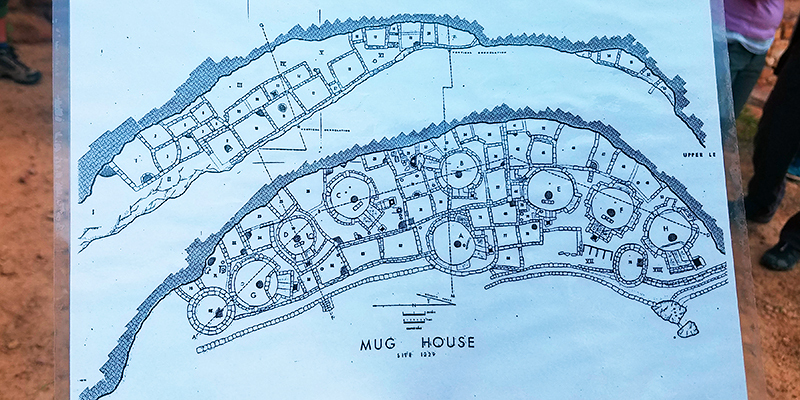 … and we finally arrive at Mug House. 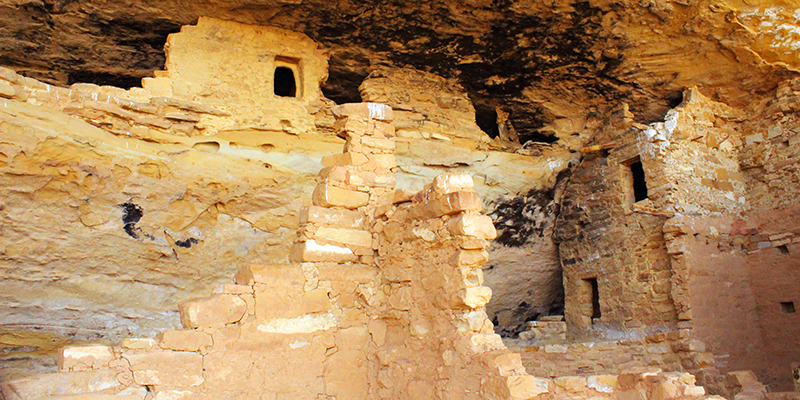 The ranger has helpful handouts indicating the types of pottery found at the site, and a diagram of how the rooms and kivas are laid out. There are potsherds scattered about and you are allowed to pick them up to study their textures, then place them back where you found them. We have yet to meet someone who has not been tempted to pocket one, but it’s the right thing to do … put them back out of respect and for other tours to experience. Not to mention, the rangers, particularly on these small tours, have eyes in the backs of their heads. 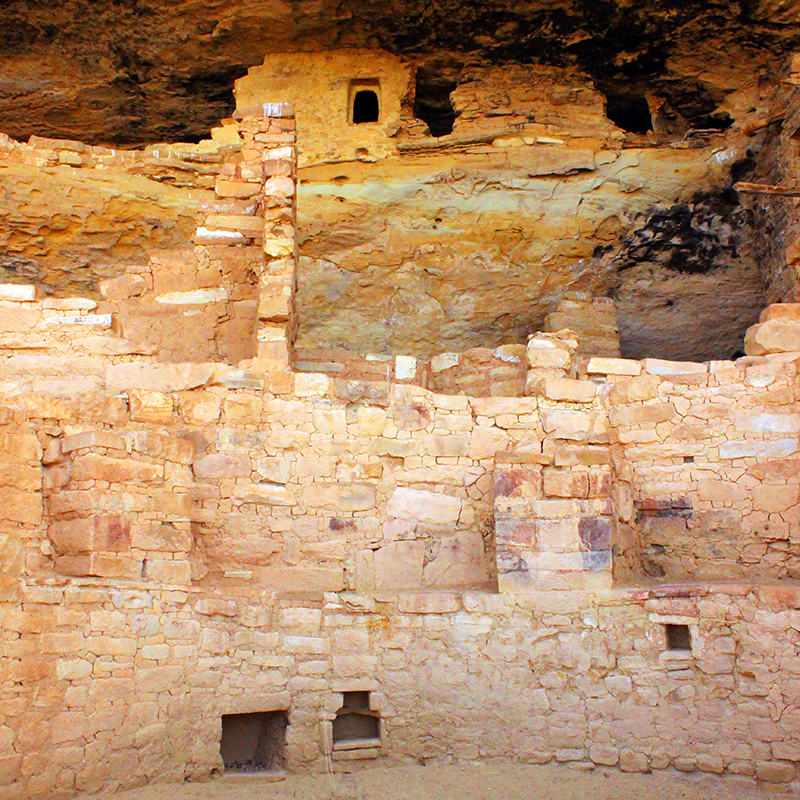 This is another reason why Mug House is so special, because this is the only dwelling we have seen at Mesa Verde with sherds on the ground that we could hold. 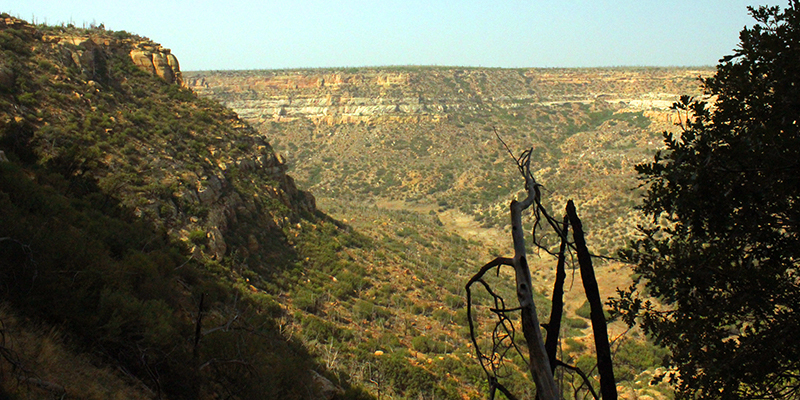 You will also experience a stunning view of Rock Canyon (pictured below). 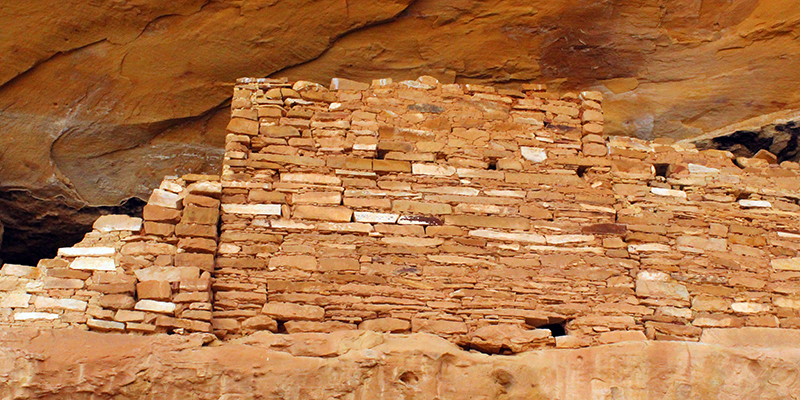 This upper wall favors the Chaco Canyon construction style of thin intricate stone work. 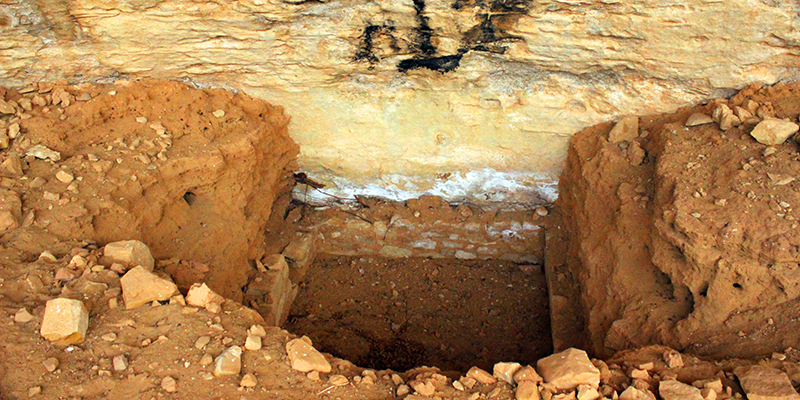 Below, a kiva with red and white plaster still visible – absolutely amazing! 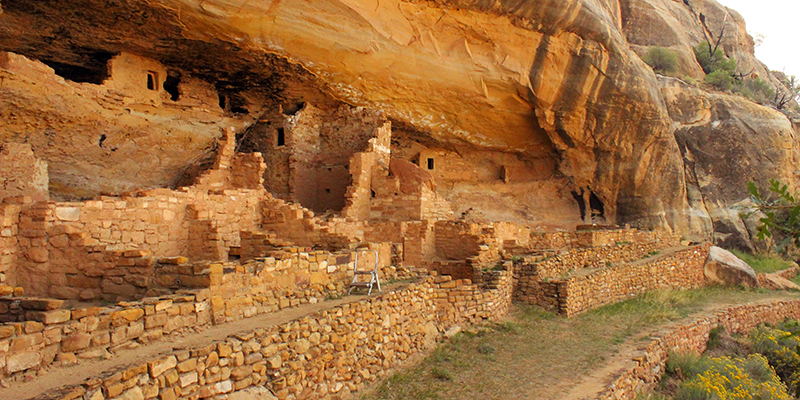 Many kivas in the Southwest are excavated and then filled back with dirt to protect them. Others are exposed to weather and the plaster has washed away. And some plaster designs have been taken to museums. Here, some of the authentic plaster from the hands of ancient artisans remains. Below shows an upper walled structure that was probably used to store grain. Notice in the upper left, the entrance is cut out a bit for a door to be inserted and then sealed with adobe mud to protect the storage. 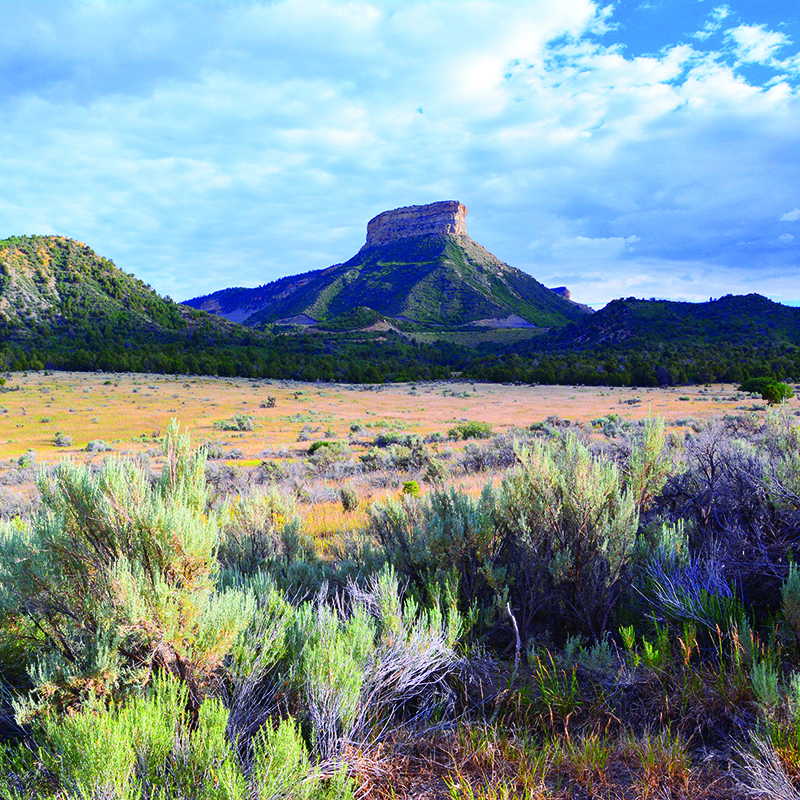 The tour gives you the opportunity to take your time and survey the area, discuss your findings with each other and the ranger, and yet the the journey back up to the top of the mesa comes too quickly for this extraordinary place. 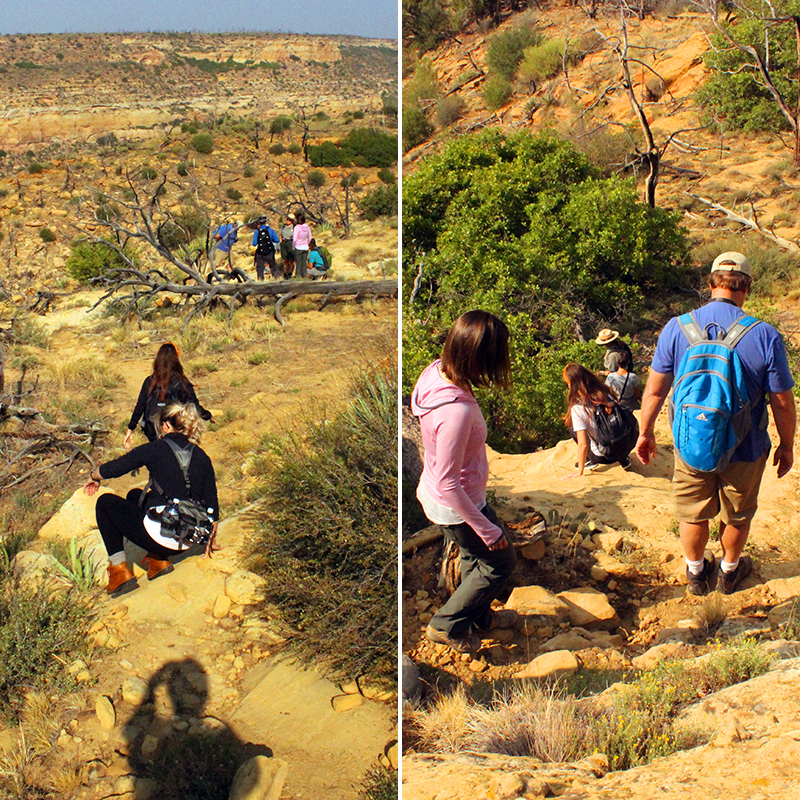 The park offers visitors opportunities to learn more through special backcountry hikes and tours guided by a ranger, and you can purchase tickets at www.recreation.gov. 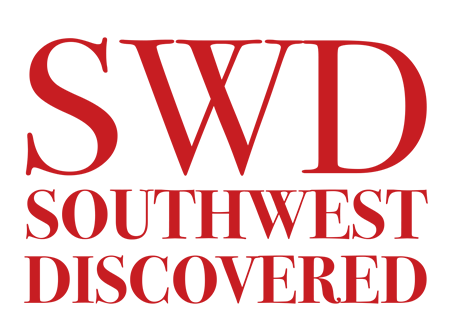 Another wonderful, awesome job of sharing an incredible experience-this one of “holy” places of the Southwest. Thank you. Stew, well …. 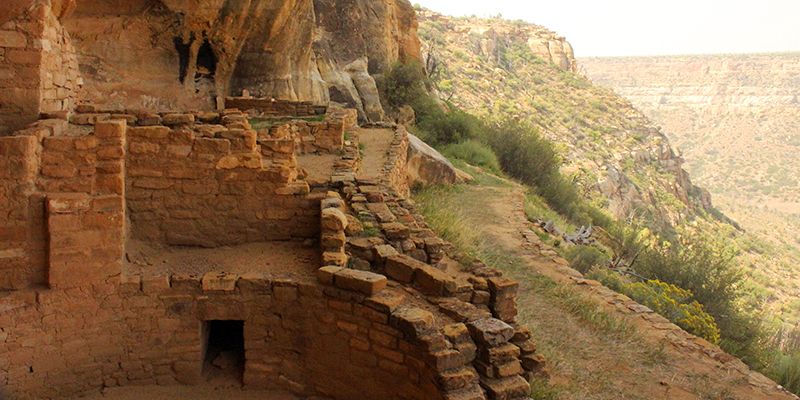 you know we’ll now and forever refer to Mesa Verde as a SW holy place. Well said, and thanks for commenting! Chile Sage, I may be going soon and will try to get pictures of the potsherds for you. This looks fascinating! Thanks! Daniella, We’d love to see them. Have a wonderful time! 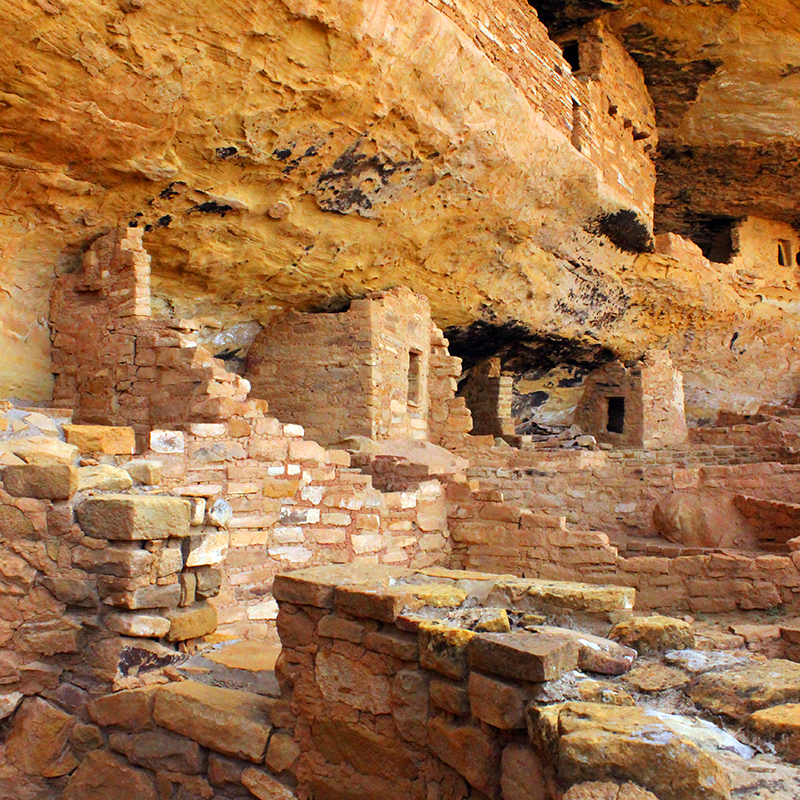 We are planning a Mesa Verde outing for September and will definitely make a point to take this tour. One of our boys is 8, do you think the hike and terrain will be too strenuous for him? Thank you for this post with great photography. T, the rangers state that young children may take the tour if they are able to manage the hike down and back up on their own, without assistance or being carried. There are steep places along the way where you’ll scoot on your toosh, and some passages are narrow on uneven ground. Have a look at the photos to determine if your son can manage it, and check with the agent when you book your tour. You and your family will love this! Shannon & Drew, when you go please send pics so we can share with everyone. GREAT photo essay! I feel like I was there on the hike with you! How did I not know about this after all these years? Amazing! Do you have any photos of the potsherds? Thank you! We were so in the moment, holding those beautiful pieces of pottery, that we completely forgot to take pics!